The Principles - These are the guiding obligations and good practices which determine whether the project is genuinely being managed using PRINCE2. 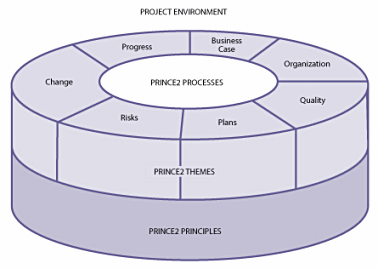 There are seven principles and unless all of them are applied, it is not a PRINCE2 project. The Themes - These describe aspects of project management that must be addressed continually and in parallel throughout the project. The seven themes explain the specific treatment required by PRINCE2 for various project management disciplines and why they are necessary. The Processes - These describe a step-wise progression through the project lifecycle, from getting started to project closure. Each process provides checklists of recommended activities, products and related responsibilities. Tailoring PRINCE2 to the Project Environment - This chapter addresses the need to tailor PRINCE2 to the specific context of the project. PRINCE2 is not a 'one size fits all' solution; it is a flexible framework that can readily be tailored to any type or size of project.